A view of the AIMS software dashboard. On Sunday, May 6, Heraeus Noblelight held a Preview & Insights event in advance of RadTech 2018, which took place May 7-9 in Chicago, Illinois. Invited attendees were welcomed by Dr. Sven Schalk, executive vice president of marketing and sales UV, Heraeus Noblelight, and Dr. PK Swain, president, Heraeus Noblelight America, LLC. Snapshot overviews were given of papers to be presented at RadTech 2018 on topics that included Curing Traditional Formulations with Multi-Wavelength LEDs, Highly Efficient UV Curing Processes Provided by UV LED with IR Irradiation, Intelligent Photon Delivery Systems Powered by IoT and Driving Microwave-Driven Additive Lamps for Improved Performance. Attendees then were invited to tour the exhibit area, where demonstrations were given on using IoT for UV curing and the Semray UV LED plug and play platform. Semrays plug and play platform offers simple scalability from one to 30 units, allowing users to easily try new wavelengths or to move from development to production. Segments can be changed quickly without tools, resulting in less downtime and making it easier for users to upgrade to new UV LED chip technology when needed. The star of the show, however, was the Advanced Integrated Monitoring System (AIMS) featured with the Light Hammer® 10 Mark III equipment. AIMS software, coupled with sensor technology in the lamp head, enables data collection of operating parameters such as temperatures, humidity, air pressure and run time hours. The data then can be viewed via a local computer, or data can be uploaded to the cloud for comparison and analysis among multiple lines and plants. Implications for a future proactive service model were of interest to attendees. 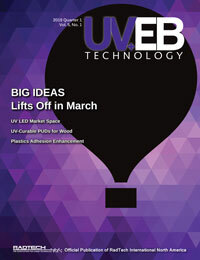 For more information, visit www.heraeus-noblelight.com/uvamericas.